I finished my personal stuffies printed at Spoonflower. 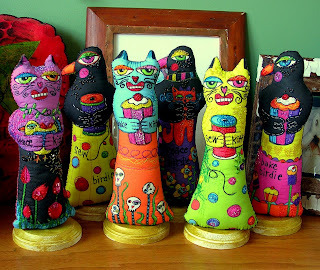 Each was cut out, embroidered, beaded and stuffed. 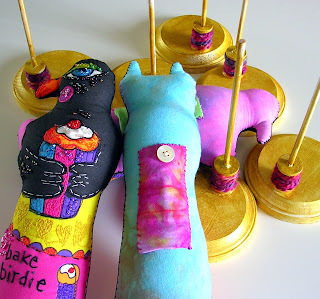 We have Peace Kitty (holding a birdie) and Peace Birdie (holding a kitty); Bake Birdie and Bake Kitty holding cupcakes; and Sew Birdie and Sew Kitty holding enormous spools of thread. I love doll forms but like for them to stand up, so I ended up making my own stands as I have done in the past. These were super simple. I created a small pocket on the back of the doll and stitched it on. The stands are simple shapes from the wood aisle at Hobby Lobby...a round beveled base, some wooden spools and dowels that fit into the spools. The spools are glued to the base and the dowels cut to 6" and inserted into the spools with glue. I used E6000 because I don't like to clamp and wait for regular wood glue. For a couple of bucks you can have personalized doll stands easy as pie. Paint them any color you'd like! These are so fun! And what a great stand idea. Congrats on your EMT! Such a fun idea. I love it! They are so wonderful!